Students gather in memory of Carlson Gracie. 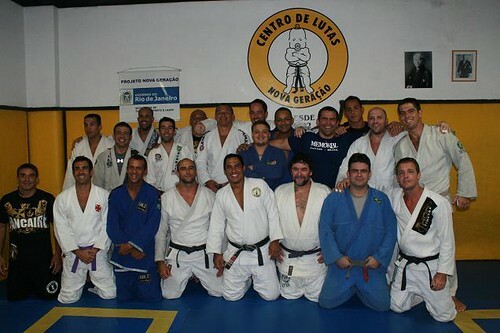 This Thursday, some old friends who represented Master Carlson Gracie’s academy had a get-together. As time went by, some went in different directions, but the memory of the master and the years lived together on Figueiredo Magalhães Road in Copacabana shall never be erased. The academy Nova Geração in Leblon was where the meeting took place. The Master responsible, black belt Carlson Francisco “Toco” wasn’t there, as he was in the USA. However, black belts the likes of Amaury Bitetti, Wallid Ismail, Bebeo Duarte, Sergio Bolão, Marcus “Parrumpinha”, Marcelo “Playmobil”, Ari Galo, Vinicinho Cruz, Vauvenargues Marinho and a number of other from the academy, like Vitor Dórea, “Skinhead”, and Carlinhos “Passa Fome” among others. The folks took the chance to teach techniques, have a few rolls, and there was no lack of horsing around. One of the most celebrated moments was the arrival of Wallid Ismail, a bit late. Next to Bitetti – both promoters of MMA events –, everyone went wild: “So which is the better event, Bitetti Combat or Jungle Fight? !” inquired Rafael Dias, bringing everyone to laughter before an answer could arise. There was also a promotion. Bebeo handed a black belt to Fausto Iglesias, who competed a great deal under Carlson. Others received their brown belts. Gláucio Motta, from Parrumpinha, and Beto Satã, from Ari Galo. There’s more coming next year! Next post Interview with the Brazilian Jiu-Jitsu and Submission Fighting star Kyra Gracie! Previous post Lepri analyses season: “To win the Worlds again, I’ll have to sweat”.